For women only, Center for Women in Transition, 508 E. Church Street in Champaign between 6:30-7:30 in the evening for intake. The church bus will then pick them up & take them to the First United Methodist Church for overnight sheltering. CHICAGO – Governor Pat Quinn today was joined by key state emergency officials to provide a comprehensive update on the state's response to the historic winter storm and freeze. As all critical and emergency state services continue, the Governor has also activated the Illinois National Guard to help emergency crews across the state provide assistance during the bitter cold and dangerous weather conditions, which have included a hazardous combination of black ice and snow drifts. Since last week, the state has deployed nearly 3,700 employees and 1,755 trucks from the Illinois Department of Transportation (IDOT) statewide to address the winter weather on state routes, and 200 staff and 182 snow plows from the Illinois Tollway. The Tollway has doubled the number of Zero Weather Road Patrols to assist customers stranded in their cars during the severe weather. Additionally, Conservation Police Officers in snowmobiles, all-terrain vehicles and four-wheel-drive trucks are assisting stranded motorists throughout the state and helping find missing persons. The Governor has been monitoring weather conditions hour by hour and has directed the state’s agencies to take a number of steps in response to the heavy snow and severe cold gripping Illinois. Yesterday, the Governor activated the State Emergency Operations Center in Springfield to coordinate the state’s response to the storm. Representatives from critical safety agencies are staffing the center 24 hours a day throughout the duration of the storm and dangerously low temperatures. As a dangerous combination of black ice and snow drifts developed overnight, Governor Quinn issued a statewide disaster declaration, which activates the state's emergency operations plan and allowed him to activate the Illinois National Guard to help state and local emergency responders with an increasing volume of calls for assistance. As conditions continued to worsen, the Governor implemented the State’s Continuity of Operations/Continuity of Government Plans earlier this morning to ensure continued delivery of critical state response services during the severe winter weather conditions while protecting the state’s workforce. The Governor has also opened the state’s more than 100 warming centers, including Illinois Department of Human Services offices throughout the state, which are open Monday through Friday from 8:30 a.m. to 5 p.m., or the Illinois Tollway Oases, which are open 24 hours a day. To find a warming center, call (800) 843-6154 or visit keepwarm.illinois.gov. Stories of heroism by rescuers continue to emerge as emergency responders work around the clock to assist those impacted by the extreme weather. Personnel from the Illinois National Guard field maintenance shop in Mattoon coordinated with Illinois State Police troopers and Illinois Department of Transportation snow plow crews to assist motorists in approximately 375 vehicles backed up on I-70 and I-57 north of Effingham Sunday evening. The backup was the result of several vehicles and semi-trucks that were stuck in snow drifts, making it impossible for snow plows to clear the route for the cars to proceed. Illinois National Guard personnel used a wrecker to pull the stranded vehicles and trucks from the road, which allowed IDOT crews to clear the road and rescue hundreds of passengers. "The men and women of the Illinois National Guard are again demonstrating their commitment to the safety and security of Illinois citizens," Brig. Gen. Daniel M. Krumrei, the Adjutant General of the Illinois National Guard, said. "We train extensively throughout the year to be ready and on the scene to help our neighbors at a moment's notice. Within two hours of activation, our Soldiers navigated dangerous road conditions in sub-zero temperatures to rescue stranded motorists." Conservation Police Officer Trent Reeves rescued seven people and two pets that were trapped by snow drifts along Route 47 north of Mahomet. Emergency vehicles could not reach the people, so Officer Reeves traveled by snowmobile and on foot to rescue the stranded individuals and deliver them to nearby emergency vehicles. All of those rescued, including the pets, are fine. Officer Jim Mayes assisted with the rescue, and himself used his truck to rescue six individuals who were stranded on Interstate 74 in east central Illinois. State officials are advising people to stay safe and take the proper precautions during this weather emergency. The Illinois Department of Public Health and the Office of the Illinois State Fire Marshal caution residents about the dangers of carbon monoxide poisoning. Carbon monoxide is produced whenever fuel such as gas, oil, kerosene, wood or charcoal is burned. If appliances are not working properly or are used incorrectly, dangerous levels of carbon monoxide can result. Symptoms may resemble winter flu or food poisoning, particularly in children, and include headaches, dizziness, nausea, and lethargy. Higher levels of exposure can cause fainting, marked confusion and collapse. If exposure continues, death can result. If your carbon monoxide detector alarm sounds, call 911 and leave the area immediately. Affected individuals should be led to fresh air. To prevent carbon monoxide poisoning, do not use a gas oven to heat your home, even for a short time; do not burn anything in a stove or fireplace that is not vented; do not use gasoline-powered engines in your house, garage or other enclosed spaces; and do not use a charcoal grill, camping stove or Sterno-type fuel for cooking indoors, even in a fireplace. The Department of Public Health also reminds people to reduce the chance of frostbite or hypothermia by staying dry and wearing several layers of lightweight clothing; covering your head; wearing mittens rather than fingered gloves; wearing warm leg coverings and heavy socks or two pairs of lightweight socks; and covering your ears and lower face. The Illinois Department of Agriculture encourages pet-owners to keep their pets indoors or ensure they have a warm shelter area with unfrozen food and water. To protect people’s pets, they also encourage everyone to use pet-friendly salt when clearing sidewalks and driveways. CHICAGO – Governor Pat Quinn today announced measures being taken by Illinois state agencies to prepare for the extreme cold and additional snowfall that is forecast for the next several days. He also urged residents to follow recommended winter safety procedures and to check on their neighbors during the bitter cold and snowy weather. Today’s announcement is part of Governor Quinn’s commitment to keeping all Illinois residents safe and warm this winter. "As we head into this extreme winter blast, state of Illinois personnel and emergency crews are working around the clock to help people stay warm and safe, while keeping roads open for those who must travel," Governor Quinn said. “During this bitter cold and snowy weather, Illinois residents should stay inside as much as possible and limit their exposure to the cold temperatures. Don't forget to dress in layers, check in on friends and family who may need additional assistance, and bring pets indoors. Residents can also take advantage of our warming centers if necessary," the Governor added. Residents are urged to take advantage of the state’s more than 100 warming centers as temperatures dip to dangerous lows. These include Illinois Department of Human Services offices throughout the state, which are open Monday through Friday from 8:30 a.m. to 5 p.m., or the Illinois Tollway Oases, which are open 24 hours a day. To find a warming center near you, call the IDHS hotline at (800) 843-6154 or visit keepwarm.illinois.gov. The Illinois Department of Transportation (IDOT) and the Illinois Tollway have their crews working around the clock to keep roads clear and passable. Motorists are urged to drive defensively and safely, travel only if absolutely necessary, slow down, and buckle up. In addition, a new state law prohibits motorists from talking on all but hands-free mobile phones while driving. Don’t crowd snowplows – an operator’s field of vision is restricted. Watch out for black ice on roads that appear clear but can be treacherous. Slow down when approaching intersections, off-ramps, bridges and shady areas - all are prone to black ice, which is often invisible. Pull over and dial *999 for emergency roadway assistance. The Illinois Tollway expects to double the number of Zero Weather Road Patrols it provides around the clock to assist drivers stranded in their cars along the 286-mile Tollway system. The Zero Weather Road Patrols provide roadway assistance when temperatures and/or sustained wind chills are below zero. The Illinois Emergency Management Agency (IEMA) will continue to monitor the winter weather conditions throughout Illinois and stands ready to activate emergency state resources if necessary. IEMA also advises every household to have a disaster preparedness kit that will help residents stay safe for at least three days. The kits should include a battery-powered NOAA weather radio, a flashlight, extra batteries, non-perishable food, water, a first-aid kit, extra medications and special items needed for babies, disabled or elderly family members and pets. If you must travel, IEMA and IDOT recommend you equip your vehicle with an emergency supply kit to keep you safe in case you are stranded along the road. A vehicle preparedness kit should include a cell phone and charger, flashlight, extra batteries, first-aid kit, snack foods and water, blankets, extra warm clothing, gloves and hats, sand or kitty litter, shovel, windshield scraper, booster cables, flares or reflectors, windshield washer fluid, and a tool kit. Always keep your gas tank at least two-thirds full to help prevent the vehicle’s fuel line from freezing. Before you depart, check weather and road conditions along your route and provide your planned route to a family member or friend. If conditions are dangerous, postpone travel until road conditions improve. IEMA and the National Weather Service have developed a Winter Weather Preparedness Guide that contains many more tips about winter weather safety. The guide is available at the Ready Illinois website at ready.illinois.gov. The Illinois Department of Public Health (IDPH) advises residents to be vigilant regarding two health conditions caused by cold winter weather that can lead to serious injury or death – hypothermia and frostbite. Infants and the elderly are particularly at risk for these conditions. Symptoms for hypothermia, a drop in body temperature to 95 degrees Fahrenheit or lower, include forgetfulness; drowsiness; slurred speech; change in appearance, such as a puffy face; weak pulse, slow heartbeat; very slow, shallow breathing; and in extreme cases, coma or a death-like appearance. If you notice these symptoms, wrap the person in a warm blanket and seek immediate medical attention. Do not give a hypothermia victim a hot shower or bath. Frostbite typically affects exposed areas of the face, ears, wrists, hands and feet. Frostbitten skin is whitish and stiff, and the area will feel numb rather than painful. If you notice these signs, warm the affected part of the body gradually with blankets, other warm wrappings or warm parts of your body like your armpits, and seek medical attention immediately. Do not rub frostbitten areas. To reduce the chance of frostbite, stay dry and wear several layers of lightweight clothing; cover your head; wear mittens rather than fingered gloves; wear warm leg coverings and heavy socks or two pairs of lightweight socks; and cover your ears and lower face. The Illinois Department on Aging is encouraging relatives and friends to make daily visits or calls to senior citizens living alone. Older people are more susceptible to the cold, so seniors should set their thermostats above 65 degrees. Those particularly vulnerable are older people who take certain medications, drink alcohol, lack proper nutrition, or who have conditions such as arthritis, stroke, Alzheimer’s disease and Parkinson's disease. · Dress in layers, both indoors and outdoors. · Keep active. Make a list of exercises and activities to do indoors when you can’t get out. · Eat well and drink 10 glasses of water daily; stock up on non-perishable food supplies, just in case. · Keep extra medications in the house. If this is not possible, make arrangements to have someone pick up and deliver your medications. · Do not shovel snow or walk in deep snow. Plan now for someone else to shovel the snow. The strain from the cold and hard labor could cause a heart attack; sweating can lead to a chill and even hypothermia. The Illinois Department of Agriculture advises residents to bring their pets indoors or ensure they have a warm shelter area with unfrozen food and water. Check frequently on any animal that remains outside. Extreme cold temperatures are dangerous and can be deadly. Since 1995, more than 130 fatalities related to cold temperatures have occurred in Illinois, making it the second-leading cause of weather-related deaths in Illinois in the past two decades. 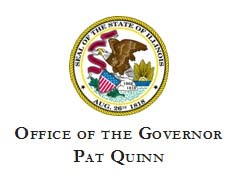 CHICAGO - Governor Pat Quinn today requested federal aid to help local governments in nine Illinois counties recover from the Nov. 17 deadly tornado outbreak. Counties included in the request include Champaign, Douglas, Grundy, Massac, Tazewell, Vermilion, Washington, Wayne and Woodford. If the request is approved, local governments could receive reimbursement for 75 percent of eligible disaster-related costs such as overtime, debris removal and repair and replacement of damaged public property. Today’s request included documentation of tornado-related expenses, such as emergency protective measures, debris removal and repair or replacement of government-owned facilities incurred by the nine counties. The information was collected by representatives from the Illinois Emergency Management Agency (IEMA) and the Federal Emergency Management Agency (FEMA) as they met with local government representatives in affected counties earlier this month. The request also noted other impacts from the tornadoes, including winter weather conditions that will delay debris clean up and rebuilding, affected communities still dealing with costs related to flood events in April 2013 and April 2011 and public property losses that may not be completely covered by insurance. Governor Quinn already has secured federal aid to help people and businesses in Champaign, Douglas, Fayette, Grundy, Jasper, LaSalle, Massac, Pope, Tazewell, Vermilion, Wabash, Washington, Wayne, Will and Woodford counties recover from the Nov. 17 tornadoes. To date, nearly 2,000 people in those counties have applied for assistance, with more than $1.3 million in federal grants and more than $1.5 million in low-interest loans already approved. The deadline for people to apply for federal aid is Jan. 27, 2014.